Dr. Travis Schwarz grew up right across the Mississippi in Collinsville IL. He graduated from the University of Illinois Urbana-Champaign and then worked on a Masters in Biology at Southern Illinois University Edwardsville. During this time he was accepted to Southern Illinois University School of Dental Medicine where he earned his Doctor of Dental Medicine Degree (D.M.D). Dr. Schwarz truly enjoys practicing dentistry and takes great pride in promoting an anxiety-free experience. 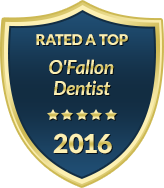 He has taken numerous continuing education courses allowing him to provide long-lasting restorative treatment and give you a healthy, pain-free, beautiful smile. His commitment to lifelong education ensures the highest level of care, both today and tomorrow. In his spare time Dr. Schwarz enjoys fishing, camping, and competing in BBQ competitions.